Geocaching is a treasure hunt game thatâ? ?s taking the world by storm. With caches hidden on the top of Mount Everest and in the middle of the desert in Afghanistan, we ask where and how did this sport begin? There arenâ? ?t many internet based hobbies that involve fresh air and exercise, but geocaching is one of them. Put simply, itâ? ?s a global scavenger hunt. All you need to play is a GPS device, a membership to a geocaching website, and a sense of adventure. The hobby has grown in popularity over the past few years, from humble beginnings in an online newsroom to a global phenomenon. This is how it happened. While GPS had been around in one form or another since the 1970s, it wasnâ? ?t until the year 2000 that it became fully available to the public. The Defence Department decided to end â? ?Selective Availabilityâ?? : the measure introduced in 1990 to decrease the precision of GPS signals. A few minutes after midnight, GPS became ten times more accurate. Needless to say, it became an essential tool for industries such as forestry. It also caught the attention of the internet. The first geocache was planted by Dave Ulmer, who originally called the game the â? ?Great American GPS Stash Huntâ?. As a GPS enthusiast, Dave wanted to test how accurate the improved satellite services were: and thought heâ? ?d have a bit of fun in the process. On May 3rd he wandered into the woods near his home in Beavercreek, Oregon, and planted a black bucket there. He filled it with a logbook and pencil, as well as a few prizes such as videos, books, and software. He then uploaded the coordinates to his favourite online newsroom, sci.geo.satellite-nav. Two people found Daveâ? ?s stash within three days, and immediately went back to the newsroom to tell everyone about it. Over the next few weeks, more people decided to join in: and Mike Teague (the first person to discover Daveâ? ?s stash) started recording all of the various coordinates on his own website. There was also a GPS Stash Hunt mailing list, where people started discussing changing the name of the activity to something more wholesome. After much debate, the name â??geocachingâ?? was chosen. For the first few months, geocaching was a very niche activity. The only people playing were people who used GPS in other outdoor activities, and who were already familiar with Mike Teagueâ? ?s website and mailing list. That all changed when Jeremy Irish, a web developer from Seattle, discovered the sport while reading about GPS technology. Seeing that there was a cache hidden near him, he decided to buy a GPS device and get involved. He enjoyed it so much that he decided to use his professional skills to launch a comprehensive hobby site. With some input from Mike, Jeremy built a database which made it easier for newbies to get started. The site, geocaching.com was announced to the community: there were 75 caches worldwide at this point. Techie magazine Slashdot ran with a story about the new sport in September. This was soon followed by stories in large publications such as The New York Times and CNN. 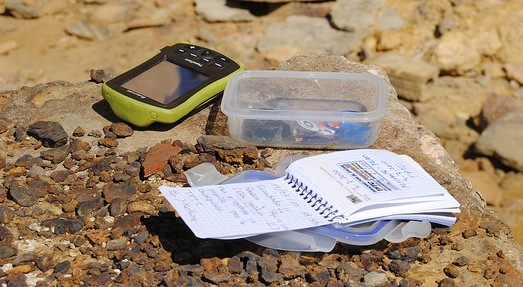 Geocaching was reaching a global audience: but the problem was that there still werenâ? ?t many caches to be found. The online community encouraged new players with the mantra â? ?if you hide it, they will comeâ?. And they did. Press coverage, word of mouth, and people accidentally stumbling across hidden caches saw the hobby expanding. By mid-2001, geocaching.com was no longer the only kid on the block. Navicache, GeocachingWorldwide, and the USENET group alt.rec.geocaching soon became reliable sources for players who worried that Jeremy Irish was imposing a monopoly over the game via his popular Geocaching site. Today, geocaching is still growing. As of November 2013 there are over 2.2 million active caches in the world, and more than 6 million people looking for them. There are caches in crazy places, such as the top of Mount Everest and the middle of war zones. Itâ? ?s no longer a niche hobby for tech enthusiasts: now people from all walks of life are getting involved. Catherine Halsey is a keen blogger with a huge passion for writing. Working with various organisations, Catherine covers topics ranging from modern technology to fitness and lifestyle.